Hello, my dear readers! Warningly welcome everyone back to my blog:-) How have you guys been doing? I have been busy with my study since my final exam is upcoming soon. A week left, to be exact. However, I still find a little time to hang out with friends and chill out on the weekend. Recently, I would spend most of my time at shopping malls to get different ambiences from staying at home. Even though they are too crowded sometimes, I somehow can find a way not to get annoyed by that. Hahahaha. Well, speaking of the department store, when I was in high school, I normally travel to there by a public transportation such as a van, BTS or MRT. It was pretty convenient to me back then in spite of competing with other people for a seat. But, after I entered to a university, of course, I grow up and am able to drive a car legally! So, my lifestyle is quite changed along with my age. Now, instead of fighting for getting into the public transportation, I face the challenge of finding a parking lot as well as being stuck in the traffic. I think most people are confronting with these problems nowadays as almost every Thai citizen seem to have a personal car. 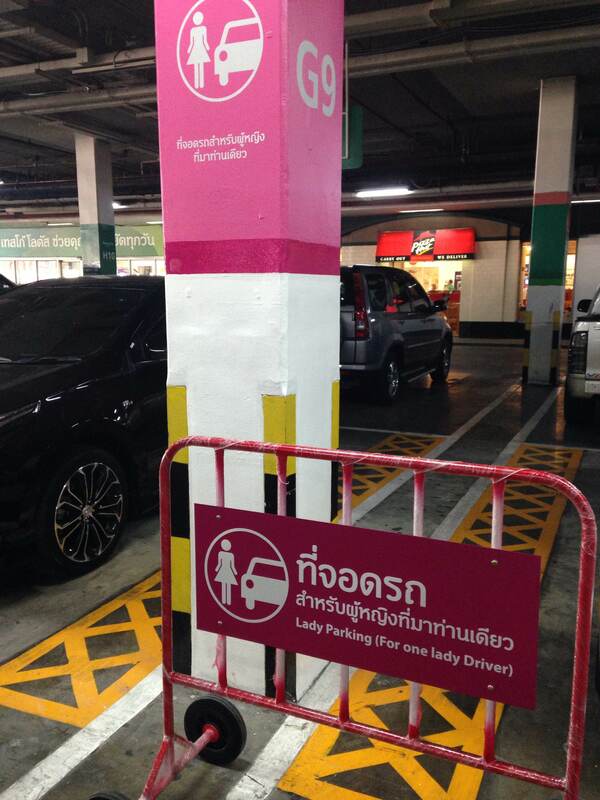 Personally, I think that the shopping mall also notices the obstacle, so they manage to come up with a solution like a lady parking. You may be curious, right? What do they have to do with lady’s parking zones? Apparently, most girls love to shop, so loads of them go to the shopping mall! To get the traffic better, it should locate the area for these people instead of letting them drive around the mall, creating a traffic jam. Nevertheless, this is only a small reason. The main reason behind is about safety and conveniences. To put it simply, ladies are portrayed as weak, passive, emotional, beauty, and fragile based on a gender code. This kind of representation of girl has been passed on from generation to generation. People in the present time still believe in this stereotype. On the contrary, guys mostly have a representation of masculine: physique, powerful, strong, and active. As a result, people in the society tend to think that dangers would happen to the ladies more often to the guys. Plus, there have already been many cases about girls being attacked by guys at the parking lot due to the darkness and secludedness, so people assume that all girls need a special security for their safety. Lady’s parking lots at the mall allow all girls to have a privilege to park their cars if they come either alone or together with other ladies and kids under 7 years old. However, it has never been promoted that all guys do not have a superior right to take an advantage of girls when they are in secluded areas. This is because of the belief of traditional stereotype from the old time, also know as patriarchy that men are more powerful in the society. The powerful one can do whatever they want, basically. Then, the powerless one needs to protect himself or herself. Besides visiting shopping malls, another place that I normally like to drop by of all time is a bookstore. My most favourite section is a traveling guide where I can be flooded with loads of traveling books. Now, I have spotted many of them writing about a solo female traveler or recommending about tips and tricks specially for females to travel alone. At the first grant, I think it is pretty cool that many publications launch this kind of book since it used to be a book only for guys which, in my own pinion, is pretty hard for women to follow. Due to dissimilar gender representations and physical elements, the traveling book for a solo male traveler may be unable to be applied for all ladies. Moreover, today it is more likely that all media are combined to gather to promote one product or a trendy fashionable idea, therefore, apart from selling a solo female traveler’s book at the shelf of the bookstore, it has been promoted on social media as well. Many solo female traveler-bloggers appear to be seen more often. From Facebook to various websites, we can notice a travel review by the female bloggers who claim that they seriously roam alone. This becomes new fashion among girls to travel alone. Several modern ideas are also promoted along the trend. For example, girls do no longer to have a boyfriend as they can travel alone, and if you are single women, let’s travel independently. On the other hand, this situation may not make all girls be happy because not everyone is into traveling alone. What if a girl named Bella, for instance, is really incapable of traveling alone although she has already followed the instruction? More importantly, what if Bella is also single, and cannot do anything independently. Then, a solo female traveling trend becomes nothing but a pressure to her! This situation is called retro-sexism where a female with new ideology and a female with old belief are not in an agreement. So, it creates a pressure and stress to the other person as she is still stuck with the same old idea. From what I mentioned above, they are all related to gender issues and traveling tendency in the present time. I try to point out that both of them are influenced each other. The best thing people should do is that they must promote both side equally! If they want to promote safety to girls, they must not forget to tell a guy that he doesn’t have special right to attack girl. Also, if one wants to travel by oneself or wants others to accompany, it is definitely his or her privilege. People in the society cannot judge them for their decision making. A solo female or male traveler is just an alternative for people, not a social measurement for traveling. Hello everyone, how are you? Have you had a great holiday? I hope you do. Now, I am back with new content about traveling. But, it is not pure traveling information because I will represent how impacts of mass media highly affect people’s traveling perception and behaviours. Without further saying, let’s get started. The impacts in this case that I am about to mention are according to theory. So, whether they can become practical or not, I will let you, my readers, judge the assumption! To start with, the impacts of mass media on people’s travelling can be separated into two main aspects just like every coin has two sides. They are positive and negative ones. I will begin with a positive aspect, first. Based on the theory, it says that the mass media are able to raise a level of awareness. In general, this statement implies that critical or important social issues presented by any kinds of mass media can more or least aware people in the society. For instance, there are so many news stories about poor public transportations in Thailand: “25 killed as public vans collided at Dong-Mueang tollway.” or “Taxi driver raped a female passenger at midnight.” All of those news have been reported consequently in a series on both TV broadcasting and social media. So, other people will fear about using Thai public transportations, and may avoid to use them. Let’s apply this to travelling. Recently, when certain places are promoted online or on TV programs, people will strongly demand to go there. This happens commonly to a restaurant review. If the place was broadcasted at day time, it turns about that the restaurant will be crowded in the evening as it gains attention from media. Apart from this, the impacts of mass media on travelling tend to expand to the point that travelling content on mass media can deal with social impacts as well. If it is a general story, social websites like change.org are helpful. In terms of travelling, people can promote directly online as well. For example, the very considerable prominent concert of Thailand, Big Mountain usually held at Kao Yai National Park in the past, so many people go there for both music and vocation. With the massive numbers of visitors, the official cannot fully control all of them. As a result, some irresponsible visitors loiter some waste affecting natural environment. Moreover, some people even took the concert as a great chance to enter to the national park, and illegally hunt and harm wild animals. Later on, more and more people who care about this social issue promote the campaign to help animals and nature on social media so that any visitors become aware of what is right or wrong. The last point of positive aspects that the mass media affect travelling is that it is in form of economics. Commonly, people can promote each place, hotel, tourist attraction and restaurant via social media. Most of the time, each famous location of each place will appear on a travelling review website. If it is a personal blog like mine, it is not an advertisement. In contrast, if it is a professional one, the places may pay to promote itself on the website in order to run better economics. Now, let’s shift gear to talk about negative sides. The first one is about consumerism. It is the idea that we have to buy more stuff than what we actually need. I will compare and give an example about this along with the positive aspect one called social impact. In social impact, I said that it helps to reserve any place that is in trouble, right? Not long ago, there is a promoting picture on social media about the world’s top ten places that are about to extinct. Instead of feeling reservation, people commented that we must go there before they become washed away! The plot twisted from the original purpose that wants to reserve good rare places. More importantly, those places have never ever been in people’s mind before. They may also plan to go to other places, but as those ten places are about to die, they eager to go without necessities. Clearly, it is consumerism. Moving along to this idea, the negative aspects include a moral vacuum which highlights the point that people get used to things, so they ignore. Let’s use the previous example—the world’s top ten places that are about to extinct. When they see it, they may neglect the issue since this kind of thing just happens in everyday life. For example, they have seen other campaigns about reserved animals before. Likely, the pattern of how the issues are promoting is the same, so audiences get familiar with it, and take no action at all. Next, it is about missing national images. Nowadays, it is the ear of pop culture because it can gain majority’s interests. While the pop culture is increasing, the original culture tends to decline. To give an example, one of famous pop cultures in Thailand is about BBQ and grilled foods in Korean or Japanese styles. This idea may result from K-drama and J-drama because most of them will have a scene of eating BBQ. Therefore, many BBQ restaurants in Korean and Japanese styles have increased. Obviously, we can see these BBQ restaurants in all department stores. Sometimes, around 5 of them are located on the same floor and nearby each other. For Thai food, you can probably find it at a food court, but it is too crowded. So, many people ended up at those BBQ restaurants. Some foreigners like my uncle who visited Thailand also thought BBQ is a part of Thai cuisine. We do have our own BBQ, but it was replaced by the pop culture. To conclude this, the impacts of mass media on people’s travelling perception and behaviours can be in both positive and negative ways. For the positive view, according to a theory, it covers the level of awareness, social and economic impact. On the contrary, the negative point focuses on consumerism, moral vacuum and missing national images.